The opportunity to earn money while taking care of your children at home is a dream that many moms would like to come true. For some, this dream is a reality because they have found a job that allows them to work from home and offers flexible hours as well. Typing is one of the most flexible jobs which makes it possible for moms to make money and raise their kids as they wish, at the same time. Transcribe Me is an online company that offers moms a chance to make money transcribing audio files. These files are generally short in length and are required to be converted into text by typing out what is being said on them. To apply, you will need to visit the Transcribe Me site and provide relevant information about yourself and educational background; get basic training on the typing job and pass a test for you to be hired. To have a better chance of getting hired, you must at least be able to understand English. If you are fast at typing, then you have another advantage when applying for the job. Also, you must have a computer that works well, high quality headsets and reliable internet. Finally, a PayPal account is needed through which payments will be made after typing work is completed, which is usually on a weekly basis.The pay at Transcribe Me is twenty dollars for an audio hour, which means that you only earn this amount after you have converted audio files that add up to that hour. Please note: An audio hour is not the same as a normal one hour time period. Rev is another company that moms can work for as transcribers. Its application process is not complicated and you do not have to be experienced to get hired. The company will require applicants to do a test and pass before offering a job, which means that you must be able to follow instructions well. Most times, you will be required to provide contact information, complete a grammar and writing test before finally taking the transcription exam to start working for Rev. Working for Rev requires moms to have a decent typing speed, a reliable internet connection for downloading the audio files to listen and convert into text, and finally a good quality headset. Payment at Rev is not standard but you can make good money on the site when committed. For an audio minute, expected pay is from $0.50 – $0.65 which adds up to $30 for an audio hour. Scribie offers freelance transcription jobs to moms that are able to capture information on audio files and type them out as text in an accurate format. You can complete the work in the day or at night which makes it possible to earn money anytime. The job is open to candidates from other countries which mean competition for the jobs may be a bit high for moms looking for jobs on the site. Fast typing skills that you can quickly transcribe files and earn more from your work. Scribie pays its transcribers $10 for every audio hour they manage to complete successfully. The pay for the work is done through PayPal which makes it easy to withdraw once it has accumulated to a substantial amount. Keep away from sites that offer typing jobs but charges an upfront fee. Get familiar with a number of legitimate work at home typing jobs. 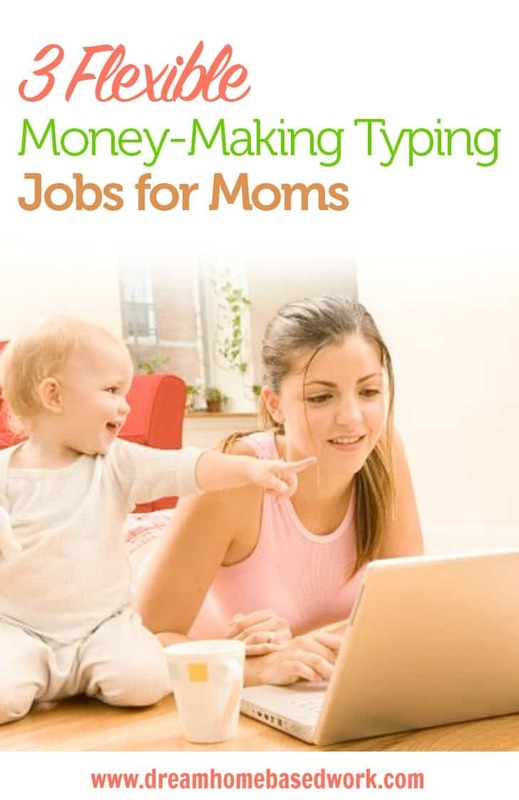 Overall, finding typing jobs that are flexible is possible for any mom that wants to earn some extra money. All you need to do is be patient when applying for jobs and when successful work hard to always deliver high-quality work. If so, I recommend checking out FlexJobs. This is a membership site with tons of hand-screened job leads from reputable companies. You can go here and see which typing opportunities FlexJobs has up now. Lashay, i sent you an email 2 times and i still have not heard anything back from you… are you sure thats your email address? Hi Lashay, I am currently a stay at home mom and so I currently don’t bring any income home. I’d like to bring some kind of income home to help my husband. unfortunetly I haven’t had any luck. Either the online job is a fake or a scam, or it just doesn’t pay enough. I’m also affraid to give my accounts away. what do you suggest for me. I do enjoy typing ….